All over the world, flowers mesmerize millions of people with their velvety, colorful petals, floral aromas, and gentle existence; and where there are flowers and sprouting leaves, there are often pollinators like bees and butterflies buzzing around. Growing up we often learn the importance of pollinators in our world. However, as our environmental state changes with factors like climate change, greenhouse gases, and other ecosystemic fluctuations, the role of pollinators becomes strained and even more crucial. According to a 2016 report by the Intergovernmental Science-Policy Platform on Biodiversity and Ecosystem Services (IPBES), 16 percent of vertebrate pollinators are threatened with global extinction, and more than 40 percent of invertebrate species are threatened in their specific regions. Across Western Europe and North America, a notable decline in wild pollinators is raising concerns among environmentalists, as 75 percent of the world’s food crops depend at least in part on pollination. Without a flourishing bee population, we run the risk of not being able to grow enough food to sustain ourselves. Environmental efforts are attempting to combat the decline in pollinators by imposing laws that conserve the safety of bee colonies, such as preventing loss of habitat, pesticide exposure, diseases, and parasites. 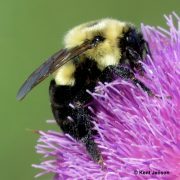 For the last several years, the decline of bees has been steadily climbing the list of pressing environmental issues. For this reason, environmental organizations are growing and there is a projected eight percent increase in job growth for environmental engineers. Wildlife conservation organizations are now also looking for the public’s help in collecting data on bees and butterflies, which is why they have commenced pollinator citizen science projects. Bumble Bee Watch is a project that focuses on the conservation of bumble bees– a highly visible pollinator that isconsidered essential to the health of ecosystems. This interactive website allows users to report sightings and engage with the collected data. The mobile application is built on BirdsEye’s field guide framework and allows users to easily identify the bumble bee species around them and quickly report sightings from the field. Click here to participate today! Another similar project is the Western Monarch Milkweed Mapper. 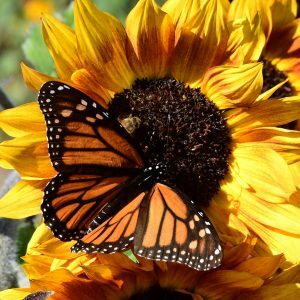 It is a collaborative effort to map and better understand monarch butterflies and their host plants across the Western U.S. The Monarch Milkweed Mapper website is packed full of interesting and useful data about this widely-recognized and high-flying pollinator. Click here to join this project! As the human population grows, our environmental impact rises and spreads to affect more nature and wildlife. This is a reason for the increase in environmental conservation and sustainability in the last 20 years. We are using both renewable and non-renewable resources at demanding rates that require sustainability adjustments if we are to maintain basic necessities, like food and water, for the growing population. This means living with intention in our day-to-day use of resources, like one-time use plastics, energy, and even light — as light pollution is part of our environmental impact. We have a remarkable and extraordinary planet, and we must prioritize coexistence with nature and our fellow animals if we hope to support life here. The U.S. has some of the best national parks in the world, containing millions of years worth of history and made up of ecologically sensitive areas. These, like the pollinators, are beginning to suffer at the hands of human carelessness. Ecosystems are sensitive; life is there now, the way that it is, because that is how it was created; slowly, like a wheel of many parts that makes it turn. Any small disturbance, even to something as seemingly insignificant as an insect or a plant can threaten the entire ecosystem, which is why it’s so crucial to learn to coexist and cause the least amount of harm to our surroundings. National parks are beautiful to photograph, with their dreamy colors, incredible landscapes and luxurious views of nature. However, conservations efforts are crucial to maintaining their integrity. Yellowstone’s Morning Glory pool has been losing its fluorescent blue hugh throughout the last 20 years, as visitors of the park have thrown coins and other objects into its depths, clogging the complicated natural pipelines in the earth that release the minerals to give it its color. As with the pesticides that are harming bee colonies, adding unnatural substances to any ecosystem has the potential to compromise its existence. It’s funny to imagine that life on earth hangs in the balance of bees, butterflies and other pollinators. While the future of pollinators and pollination is unclear, it’s certain that environmental organizations are putting forth a lot of effort to reverse the damage done to bee colonies and to prevent the extinction of any of their species. Pollinator citizen projects can help give wildlife and environmental conservation groups the information they need to plan their courses of action and to be more successful in their endeavors to save the declining bee populations. They are asking the public to help track them, and while participating can be a fun way to get involved, it’s also important to reflect on your own environmental impact and what you, as an individual, are doing to reduce your carbon footprint and help save the planet.